For today, the theme is blue nails, and this manicure kind of had an unexpected inspiration, but it happened to line up with the first home game of the season at my alma mater. 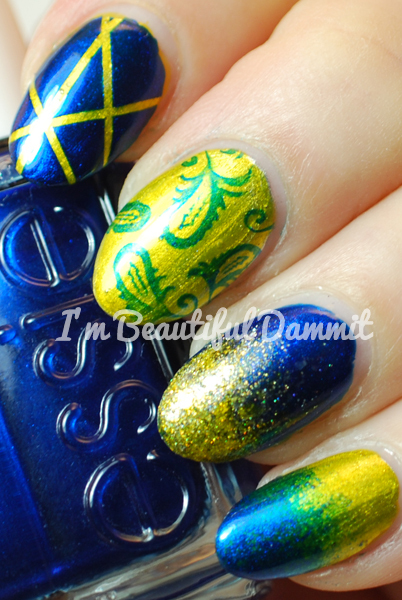 So in light of this, I decided to this manicure featuring the school colors. I did a mix of different things here. I did a gradient, stamping, and used striping tape. Each nail is different, using the same color color scheme. Nothing like a little nail art to show support for my team. Go Rockets! OPI - Silver Canvas for the base color on all but ring finger. OPI - Primarily Yellow layered over the silver base and Holo Yellow to give it a more warm yellow tone..
Kleancolor - Holo Yellow on the ring finger. Essie - Aruba Blue used for everything blue that you see!